* Transportation Manila-Zambales-Manila is not included in the package. 1. Proper surfing form: posture, foot stance, arm placement, and basic turn. 1. Ability to paddle and control, turn turtle (eskimo roll), and catch waves. 2. Perform basic maneuvers: bottom turn, snaps, and trimming. This trip is only for people who want to meet new friends and are game for an awesome weekend adventure! Cool prizes from QUIKSILVER and ROXY are in store for all winners! 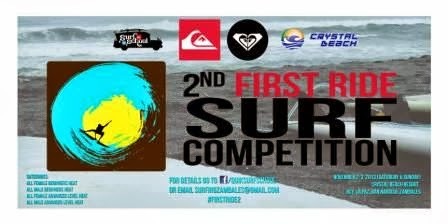 Or email us at surfingzambales@gmail.com for questions and inquiries.